Garages are often the last place heat is added in a home but can become necessary to have a comfortable work area. Often it depends on the climate of were you live that will dictate the best way to heat a open space such as a garage. What works in Arizona likely wont work as well in Alaska. Also cost is always a factor with some low cost options versus more expensive units. 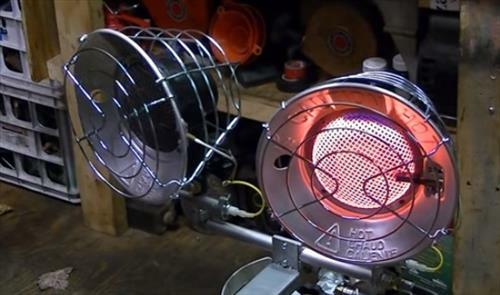 Propane heater can be ideal in the right situation. They are low cost, put out a lot of heat, and are cheap to operate. The downside is it must have ventilation. This would be ideal when the garage door needs to be open otherwise they can become dangerous. If you already have a propane tank than having one is always good since they can be used in other scenarios such as camping. Units are very portable and store away easily. 120 volt electric work-space heaters also a good option. They are mounted on a wall or ceiling and can put out a lot of heat. More than one can be bought adding more heat when needed. Heating a space with electric heaters is not the most efficient way to heat a space, but does get the job done and is used by many to heat their garages. Mini Split Heat Pumps are possibly one one the best options sine they also cool in the summer. Heat pumps are basically a air conditioner that can be reversed to also put out heat. They are widely used in the Southwest United States since they are very efficient to run and both heat and cool. The downside is they cost more and take some skill to setup. There is many DIY kits for a handy person, or a HVAC company can install a unit. Heaters specifically designed for a garage can also be used and come in electric or gas packages. They are usually hung from a ceiling and do a very good job of heating up a open space such as a garage. Adding heat to a garage can be done in multiple ways from gas to electric. Mini Split Heat pumps are also a option since they can also cool down a garage when the weather turns and it becomes hot. Of course everyones scenario will be different and what works for one likely wont work for another. How well a garage is insulated will also add to what type of heater is needed. As always be sure to read reviews on a unit on Amazon or elsewhere to be sure a package is a good fit for you.